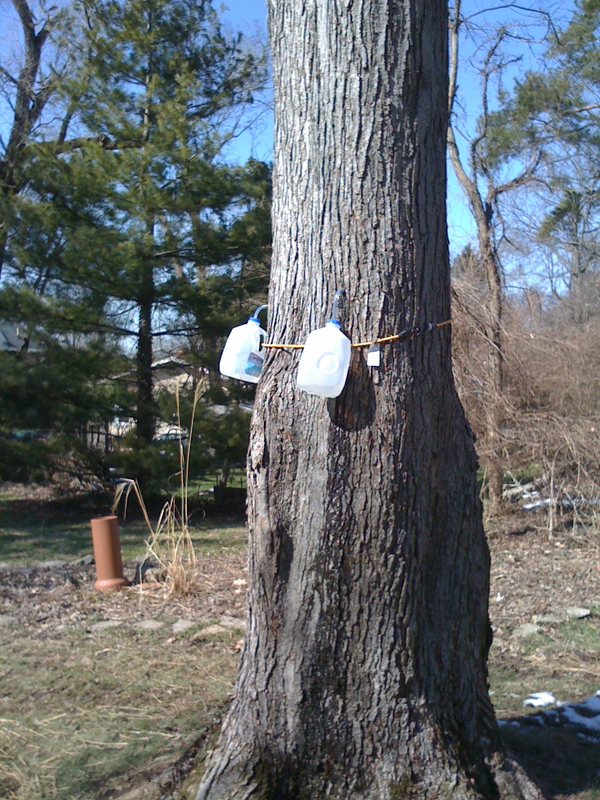 In the spring, my charming/effusive/verbose brother-in-law made maple syrup — in his Cincinnati backyard. I was all, “Wait, normal people make backyard maple syrup?” No one said my brother-in-law was normal (har har), but he is willing to go the distance for an interesting DIY experiment. Read on, readers. I’m not really good at saying “no” when people want my insights on different topics or want me to attend a meeting or need me to head up a committee. Nor am I good at saying no to myself when it comes to backyard / DIY project ideas. So when Suzanne asked me to share my experiences as a first-time independent boiler of maple syrup, I definitely couldn’t pass it up (whether I wanted to or not). I began thinking about how I might go about presenting this in a manner as edutainmental as possible (“As long as there are pictures – you have pictures, right?”). The whole thing was richly satisfying, and quite tasty, but it was a genuine learning experience. See, back in the day, my school district owned this enormous woods behind our high school, and with our town being located in upstate New York, the woods was naturally heavily populated with sugar maples. Traditionally, the biology / botany teacher would clean up the sugar shack and the students would help with tree-tapping, sap collecting, boiling and finishing. I did this, sometime in my sophomore year, I think. The timing now is vague, but the memory of a sweet-smelling and sticky shack on the edge of the woods remains. 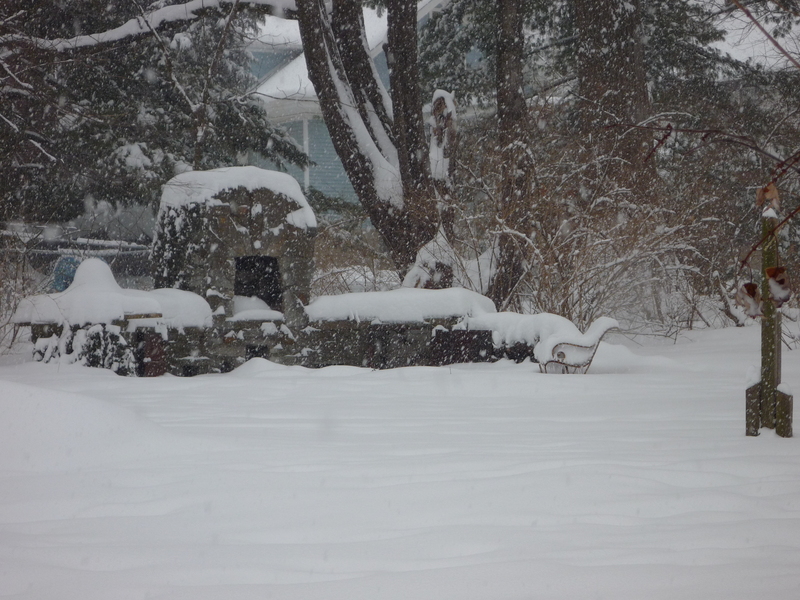 I knew I didn’t have a sugar shack on my property – yet – but I did know that I have a killer stone barbecue and fireplace that would serve as an ideal place to boil some sap. I just had to get said sap out of the tree. A lot of sugaring is timing – get that one week in winter when things start to warm up between 36 & 42 degrees (Fahrenheit) with a fair amount of sun, and the sap starts running. I ran myself over to the Hamilton County Parks facility to purchase some spiles (cast aluminum, Made in Canada, of course), grabbed my cordless drill, and made sure my collection apparatus was ready to roll. Back in the day, we used the old school galvanized buckets – while tried and true, they inevitably led to bugs or leaves or twigs in the sap that would have to be filtered out. I needed something a little more practical for the purposes of my backyard sugaring operation. After a little research and a lot of pondering, I decided on a collection system using hoses and gallon water jugs from the local grocer. An X-shaped incision in the screw-tops made for an ideal place to insert the hose, and the handles made for easy transport to my central collection container. You might initially think, “Well, recycle yo’self and just use milk jugs.” Wrong-o, reindeer: the milk leaves a residue from proteins that even soap & water won’t completely eliminate. Besides, you ever try to really wash a milk jug? Right, not so much. Water jugs are perfect and cheap and have no residue. 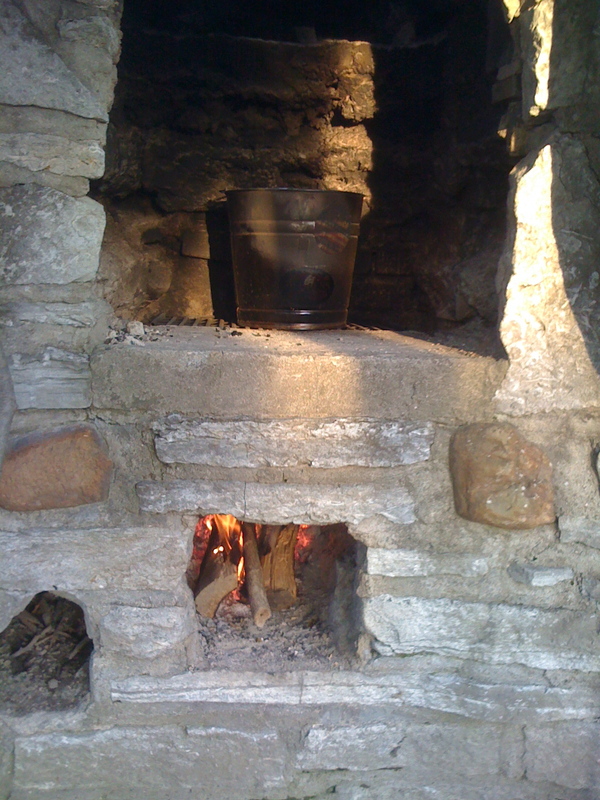 Once the weather was right and the sap was running – which, coincidentally, all happened on one of my days off from work – holes were drilled, spiles inserted, hoses were attached and inserted into jugs and sap ran and ran and ran. I’ll be honest, those first few hours of bucket monitoring were pretty exciting, as I had nearly a half-gallon from one tree by the time we got back from dinner. The first part was done. The patient collection of sap would follow. I kept them high so the dog couldn't pee on them. My fanaticism manifests itself in different ways, depending on the time of year: From October through late Spring, I bleed Buffalo Sabres blue & gold and I’m often found screaming at the television in The Man Den; from April 3 until the Reds are mathematically eliminated from playoff contention, I’m often found screaming at the television in The Man Den; in late July and August, I put on my headlamp before bed and inspect the vegetable garden to make sure my deer netting is firmly in place and my precious tomatoes are safe from varmints. One summer, I lost sleep while having nightmares about walking out one morning to behold a devastated crop from ne’er-do-well deer that had turned my garden into a smorgasbord. I did not sleep soundly until 8-foot-tall deer netting was in place. This is the kind of crazy that I am. Sap season was no different. With the sun going down early, as it is wont to do in the winter, I was forced to check my gallon jugs in the dark after work each day to prevent overflow and loss of precious potential syrup. My trusty headlamp – the most practical Christmas gift my mom ever gave me – now became a true year-round tool. 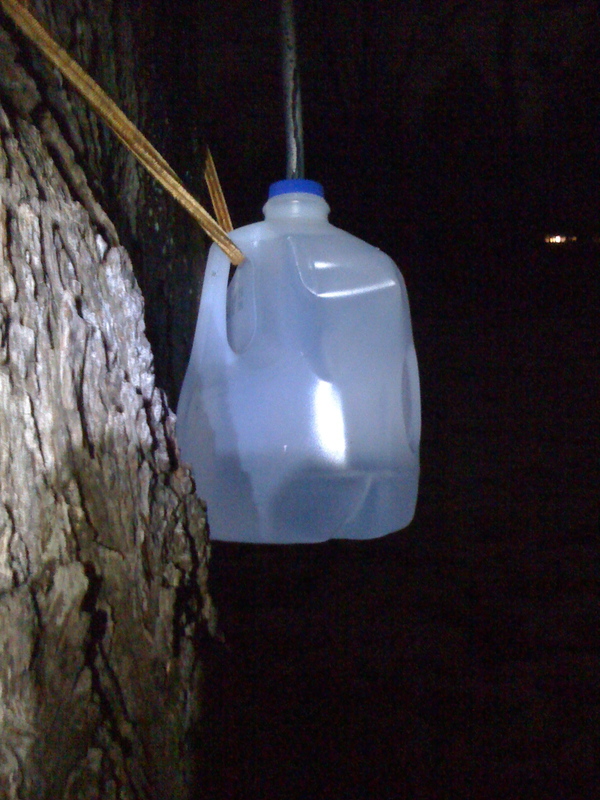 When the sap was really running, I’d come home during my lunch breaks to empty jugs, then empty them again before bed. That’s the kind of sap flow I was dealing with, and I was (dare I say) giddy with delight. I even roped my buddy Nick to help with the collection while we were on vacation, because as anyone knows, fanaticism is so much better when shared and spread as wide as possible. There’s a joke about religion in there somewhere, but this is neither the time nor the place. We have bigger fish to fry. 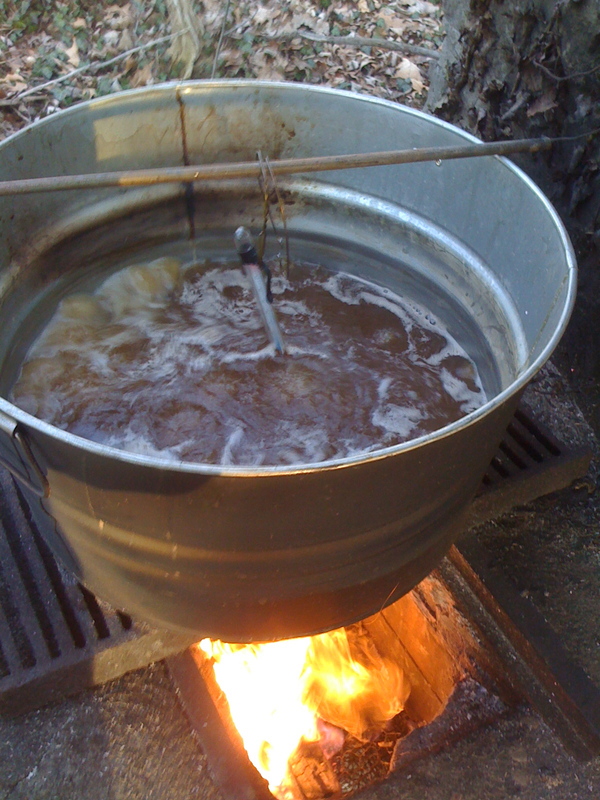 After collecting somewhere in the neighborhood of 38 gallons of sap, I decided that it was time to start boiling. Now, there are two different schools of thought when it comes to boiling or evaporating: the first is that it should be boiled in batches at regular intervals, as to ensure freshness. The other is that a certain period of storage can actually help to develop flavor and character in the final syrup product. I unwittingly chose the latter, and I did so mostly out of ignorance, but also out of necessity. sap. I knew in order to be as efficient as possible with the process, I’d have to use one of my smaller galvanized buckets to “pre-heat” smaller batches of sap. This worked quite well, as the addition of 2 gallons at a time only caused me to lose approximately 15 degrees off of my boil. I will say that this is by no means the most efficient method of evaporation – large, shallow pans over a large, consistent heat source are ideal. I had none of this. Several hours and a hell of a lot of split maple logs later, however, and we had a large vat of caramel-colored, thickening liquid. It wasn’t syrup yet, but it was sweet and it was getting there. That night, I went out to Chalk for my birthday dinner with some dear friends smelling of smoke and maple and life was good – I even had a maple-bacon Manhattan as an aperitif. But I didn’t yet have syrup, and even after 9 hours of boiling, I knew it would take a lot more time to get to where I needed to be. Day 2 of Operation Boil got us there, despite rain and wind. 7 more hours over the open flame with a total of 25 gallons of sap boiled town to approximately 2 gallons of near-finished product. I filtered it a few more times through my series of mesh and cheesecloth sieves and took the warm amber into the house for finishing. Over the power burner on our gas stove, I could carefully control the heat when the syrup got into the sugar supersaturation zone between 212 and 219 degrees Fahrenheit. This step is crucial to not wasting all of your time and efforts of the previous two days. Patience and constant vigilance (“CONSTANT VIGILANCE!”) are your allies in the finishing process, as is a good instant-read digital thermometer. When you hit that magical number – 219 – there’s something that takes place that evokes a certain euphoria. You have created an elixir, a sweet draught of natural goodness that is nothing short of sorcery (well, actually, it’s chemistry and thermodynamics, but whatever). MAGIC! Bottles were acquired from The Container Store (where else would you get containers?) and sanitized. According to my dear friend Virginia, in Vermont, friends and neighbors all contribute to the all-night sap boils by bringing half-empty liquor & wine bottles. The remnants are consumed by those in attendance, and a heady buzz permeates the area. 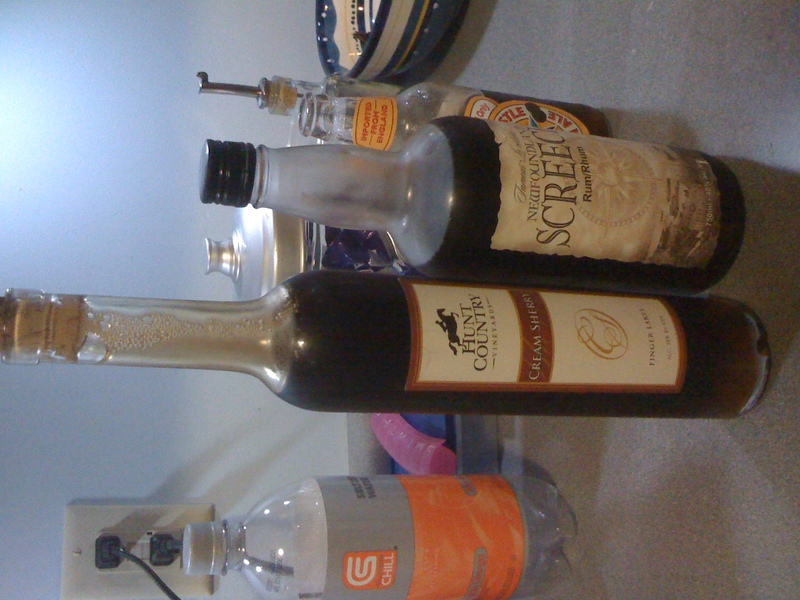 In that tradition, I utilized a bottle of Hunt Country Vineyards Cream Sherry and a bottle of Screech, my favorite Canadian Rum. Both seemed fitting for the occasion. Tasty the first AND second times they got emptied. The final product was dark and sweet and rich and beautiful. It was christened “Blackened Voodoo Dark Magic 2010 – An Organic Single Origin Maple Syrup – Pleasant Ridge, Cincinnati.” As learning experiences go, it was truly epic. As tasty backyard DIY experiences go, it was a rousing success. It inspired me to continue my vegetable gardening and explore the possibility of other urban backyard experimentation: beehives, chickens, ducks, goats, grapevines. All that stands in my way is a disapproving wife and a full-time job. Inspiring! I just moved and, alas, have no room to garden (not that growing an unreasonable amount of turnips ever helped anybody anyway). My lack of dirt has transferred my skills to making hats. The end. Making hats? Awesome! The end. Unsolicited testimonial – the syrup was scrumpdelilicious! !